The big new addition is a another Adversary mode, Lost vs Damned. This mode pits a team of “Angels” against a team of “Devils.” Every 60 seconds, the time of day changes. At night time, the devil team has firearms, while the angels get hatchets. When the sun rises, the devils lose their firearms and the angels get the guns. Each team can only score during their “time of the day,” so for example the devils only get points for killing angels during the night. When it’s not your time of day, kills take away points from the enemy team, but won’t add any to your scoreboard. When the time is up, the team with the most kills wins. Lost vs Damned is a neat idea, but after a few matches I got my fill. Unlike last year’s Slasher mode—which I played for days and really enjoyed—Lost vs Damned isn’t very fun. If you buy the Sanctus, you get an exclusive t-shirt too. It’s a nice gift, because a lot of players will probably be low on funds after buying the bike. 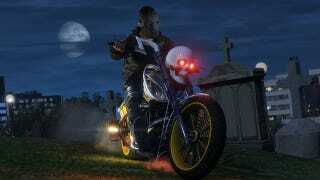 On Halloween night Rockstar is going to be doing a double RP and cash event. A special playlist will also be available, and it will contain modes like Slasher and Come Out To Play. If you are planning to stay in on Halloween night, GTA Online might be a good option. What says “Halloween” more than shooting a costumed person with a shotgun? Zach Zwiezen is a a writer and critic currently living in Kansas City, Missouri. He has written for Gamecritics, Killscreen and Entertainment Fuse.